Randi and I decided to head over to Twin Cay to gather some additional specimens for our experiments. We hopped behind the wheel of our trusty Panga (Pangas also made an appearance in Belize blog #2! ), and made the crossing over rough water to Twin Cay. Twin Cay is a small strip of land and seems to be completely covered in mangrove trees. (Explore Belize's mangroves further here and here.) It is an island split nearly in two by a saltwater river running straight through the land. 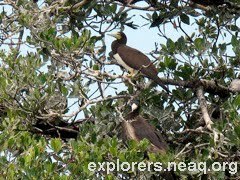 The breeze was strong enough to keep any insects away, and the air was filled with the many birds that make their homes amidst the mangrove canopy. The saltwater river carried us past a Belize Fisheries Department station and toward the interior of the island. The water was murky, and very warm when I tested it with my hand. Many invertebrates use the mangrove roots as structure. This looked like a good place for a crocodile to hide. 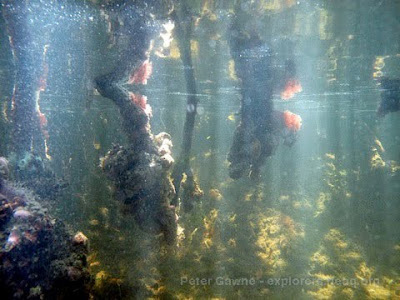 We slipped out of the boat and began snorkeling up the creeks that run through the mangrove forests. These creeks are little more than shoulder-wide where mangrove meets water, but under-cut a great deal beneath the surface. In effect we were swimming beside a great, dark cave in water where the visibility was less than three feet. I wished immediately that I had not spoken to Alex and Dan about saltwater crocodiles (Crocodylus acutus). Although these creatures are not known to be particularly aggressive, they do grow to twenty feet. My imagination caused crocodiles to be seen around every bend in the shallow creeks. I very much respect Alex and Dan for heading into the mangrove swamps day after day, listening to the croaking and splashing of the crocodiles. We did not find what we were looking for in the creeks, so we decided to head into some of the lagoons formed by the mangroves, and try our luck in slightly more open water. The visibility was perhaps worse in open water than it was in the creeks, but for some reason crocodile attack seemed less likely. We finally began having some luck finding what we had come to Twin Cay to find, and were shortly thereafter loading the boat with plant samples. I hopped in the boat and Randi remained in the crocodile infested (not really) water to hand me the samples. The water had become so cloudy from our efforts to collect samples that the visibility was reduced to nearly zero. I actually saw a small shark swimming to investigate the cloud of muck that we had stirred up. I shouted to Randi so that she might have a chance to see it, but she was unable to see it despite the fact that it was less than five feet from her. The shark got to within a few feet of Randi, and quickly bolted for deeper water as soon as it saw her. 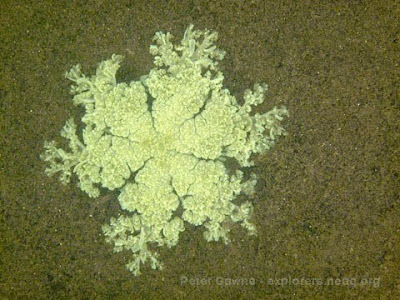 Cassiopeia jellies decorate the bottom like sinister snowflakes. Each one is unique in the layout of its oral arms and tentacles, but disturb them and they will release stinging nematocysts cells into the water. 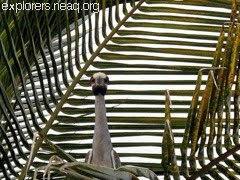 The animal diversity within the mangroves is far different from that of the open reef. While barracudas and snappers patrol the margins of both reefs and mangroves, animals such as manatees, Cassiopeia jellies, and crocodiles rarely stray from the protection and foraging grounds of the mangroves. We were lucky enough to see a manatee in the distance, and carefully approached. The manatee proved too wary for us in the end, and hid its massive bulk in the shallow, murky water. A cloud of frigate birds looms over Man-o-War Cay. Not far from Twin Cay was a very small mangrove island, Man-o-War Cay. As we approached Man-o-War Cay a great black cloud loomed over the isle. 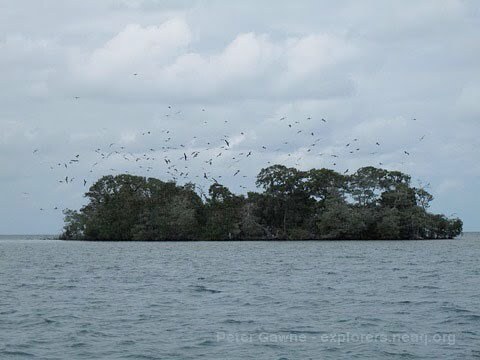 From far away it looked as if a huge swarm of black gnats covered the cay, but as we neared the island it was clear that this was a nesting colony of frigate birds. Male frigate birds inflated their front pouch and beat a drum-like rhythm in order to attract a mate. The sight and sound of the frigate colony was overwhelming. I had been in several large bird colonies before, but never with birds quite the size of the frigates. Off the coast of New England, I have worked with the Seabird Restoration Project, which involves working inside tern colonies. To see a couple thousand terns take to the air to defend their nests is a spectacular sight. While the frigates at Man-o-War Cay were not nearly as numerous as the terns, they made up for it in sheer mass. These birds were big. A full grown frigate bird can have a wingspan of over seven feet, and their silhouettes looked like something out of a Batman movie. Bird colonies can be an all out assault on the senses. Visually, they are quite impressive, and usually recognizable from a long way off. As one nears a colony, other senses are engaged. Bird colonies in general, and Man-o-War was no exception, tend to stink a bit. I have never found it to be overpowering, but there is certainly a familiar smell associated with large aggregations of birds. As we got a little closer, the sound of the colony begins to swell. By the time we were right atop the colony, the chorus of the birds had risen to a roar. 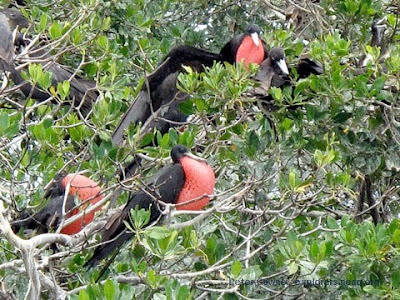 Frigate birds are mostly silent in flight, but they make bizarre rattling, clicking, and grunting sounds in the nest. Add to this the inflated scarlet-red throat pouches of the males, and the scene can be otherworldly. The closest island to Carrie Bow is to the north, and is referred to as South Water Cay. South Water has some modest habitation, with a few small resorts tucked along its shores. South Water is also home to Pelican Pouch Resort which served as a resupply for provisions on Carrie Bow, if and when the cupboards ran short. The staff at Pelican Pouch frequented Carrie Bow to be certain that we had everything that we required, and we all very much appreciated their attention and good nature. I have been told that Pelican Pouch will share duties with the Smithsonian field station at Carrie Bow for an upcoming SECORE project. I am certain that the researchers will be well taken care of. South Water Cay had a lot more vegetation than Carrie Bow, which encouraged birds to alight on the island. Osprey, brown pelicans, cormorants, Sandwich terns, night herons, and various gulls are all residents at both South Water and Carrie Bow. We got the pleasure of watching ospreys take numerous fish from the back reef at Carrie Bow. The ospreys would then have to run the gauntlet of frigate brids who sought to steal the ospreys’ catch. Some really incredible high-speed chases ensued, with the result being in favor of the frigate birds more often than not. This little bird was knocked out to sea after a particularly violent storm. We tried to identify it, but came up short. I'd love to know what it was. During periods of high wind blowing out from the mainland, the cays can get some unusual visitors that get knocked out to sea. 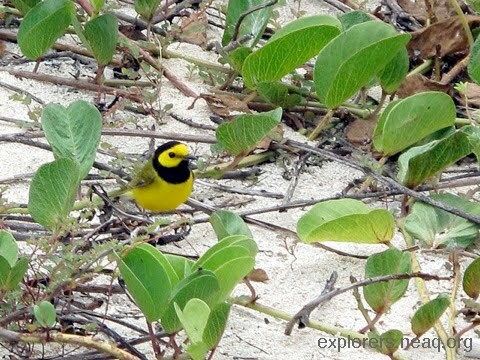 We had swallows, yellow warblers, nighthawks, and many other colorful little birds that stopped on the islands, presumably to rest after getting blown out to sea. Those are the islands in the vicinity of Carrie Bow. Each of them seemed to have its own appeal, and I feel privileged to have visited them all.